The RNC is investigating the theft of a recreational vehicle in St. John’s. Sometime between Thursday, March 14, 2019 and Tuesday, March 19, 2019, a snowmobile was stolen from Blackhead Crescent in Shea Heights. The snowmobile is a 2006 Bonbardier MXZ 800X. It is black in color and the VIN # is 2BPSBB6M56V00039. Anyone with information is asked to call the RNC at 729-8000 or contact Newfoundland and Labrador Crime Stoppers at 1-800-222-TIPS (8477), by Secure Web Tips by clicking the "Submit a Tip" button, or by downloading our free and secure mobile app. Search your App Store for "P3 Tips". Electronic tips submitted to Crime Stoppers are encrypted, entirely confidential and completely anonymous. Sometime between Friday, March 22, 2019 and Thursday, March 28, 2019, a snowmobile was stolen from the area of East White Hills Road, St. John’s. The snowmobile is a 2015 Renegade XRS. It is black in color and the VIN # is 2BPSUMFS2FV000183. by Secure Web Tips by clicking the "Submit a Tip" button, or by downloading our free and secure mobile app. Search your App Store for "P3 Tips". Electronic tips submitted to Crime Stoppers are encrypted, entirely confidential and completely anonymous. The RNC is investigating the theft of a trailer and recreational vehicles in St. John’s. Sometime between 6:00 p.m. on December 27 and December 29, 2018, a 24-foot Ridgeline utility trailer was stolen from the Witless Bay Line. The trailer was parked approximately 300 to 400 metres from the Southern Shore Highway. The trailer, bearing NL licence plate # TGF 573, is described as a black Ridgeline, 24 feet in length with two ramps connected to the back. If you have any information on this incident, please contact Ferryland RCMP at 709-432-2440. To remain anonymous you can contact Crime Stoppers by calling 1-800-222-TIPS (TIPS is 8477), by Secure Web Tips at www.nlcrimestoppers.com, or by downloading our free and secure mobile app. Search your App Store for "P3 Tips". Electronic tips submitted to Crime Stoppers are encrypted, entirely confidential and completely anonymous. The Ferryland RCMP are seeking the publics assistance in solving the vandalism of two vehicles near Witless Bay Line. On November 6th, 2018 at approximately 3:45 pm, Ferryland RCMP received a report of two Toyota Tundras parked near Witless Bay Line with their side windows smashed out. The incident occurred near where fibre op lines had been cut on the previous day. No suspects or witnesses reported and no video is available however It appears a rock was used to break out the side windows of both vehicles. Vehicle owners say only a pair of Bushnell Binoculars were taken. Anyone with information on this incident is asked to call the Ferryland Detachment 709 432-2440. To remain anonymous you can contact Crime Stoppers by calling 1-800-222-TIPS (TIPS is 8477), by Secure Web Tips by clicking the "Submit a Tip" button, or by downloading our free and secure mobile app. Search your App Store for "P3 Tips". Electronic tips submitted to Crime Stoppers are encrypted, entirely confidential and completely anonymous. On November 1, 2018, at approximately 6:30 p.m., Burin Peninsula RCMP responded to a report of an unconscious man on Ville Marie Drive, near Canada Post. The man was transported to the Burin Peninsula Health Care Centre and treated for serious head injuries and has since been transported to the Health Sciences Centre for further medical treatment. Police are asking anyone who may have been in the area of Mary Brown’s and the Post Office on Thursday November 1st at approximately 6:30 PM to report any activity they witnessed to aid in the ongoing investigation. Anyone with information regarding this incident are asked to contact Burin Peninsula RCMP at 709-279-3001. To remain anonymous you can contact Crime Stoppers by calling 1-800-222-TIPS (TIPS is 8477), by Secure Web Tips by clicking the "Submit a Tip" button, or by downloading our free and secure mobile app. Search your App Store for "P3 Tips". Electronic tips submitted to Crime Stoppers are encrypted, entirely confidential and completely anonymous. 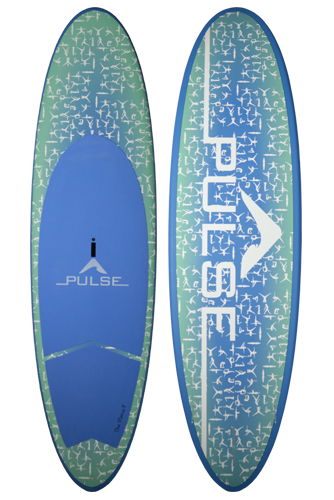 The Deer Lake RCMP is seeking the public's assistance in solving a theft of two paddle boards in Pasadena. 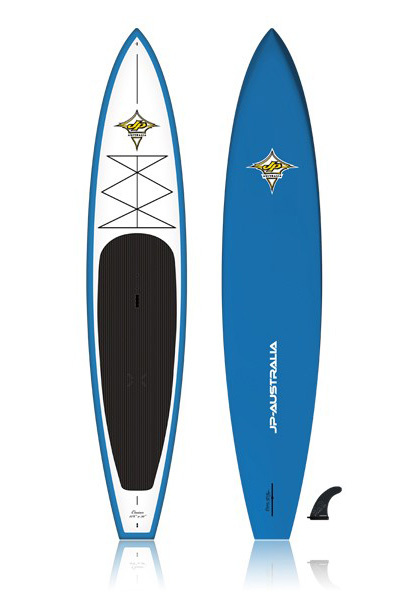 2) JP Australia - 11ft long, 30 inches wide and 6 inches thick, It is approximately 15 lbs inflatable zodiac material with a blue top and white bottom. The Ferryland RCMP is seeking the public’s assistance in solving this attempt theft & mischief of a vehicle, on Beachy Cove Rd, Tors Cove, NL.The attempted theft & mischief of a 2005 Black Volkswagen Jetta occurred while parked at a cabin on Beachy Cove Rd between 4pm on Saturday, August 18, 2018 and 2pm on Friday, August 19, 2018. The suspect attempted to remove the vehicle ignition, and disengage its anti-theft system causing significant damage. The RCMP are also requesting if any home or cabin owners in the area have video surveillance that can be reviewed to please contact police. If you know anything about this crime, please contact the Ferryland RCMP at 709-432-2440. If you wish to remain anonymous, you can contact Crime Stoppers by calling 1-800-222-TIPS (TIPS is 8477), by Secure Web Tips at www.nlcrimestoppers.com, or by downloading our free and secure mobile app. Search your App Store for "P3 Tips". Electronic tips submitted to Crime Stoppers are encrypted, entirely confidential and completely anonymous. The Ferryland RCMP is seeking the public’s assistance in solving this break, enter and theft of a firearm from a cabin in Track Rd, Horsechops, NL. The incident occurred between Tuesday June 26, 2018 and Friday June 29, 2018. A black Ruger .22 calibre rifle with scope was stolen. RCMP are also requesting if any home or cabin owners in the area have video surveillance that can be reviewed to please contact police. If you know anything about this crime, please contact the Ferryland RCMP at 709-432-2440. If you wish to remain anonymous, you can contact Crime Stoppers by calling 1-800-222-TIPS (TIPS is 8477), by Secure Web Tips by clicking the "Submit a Tip" button or by downloading our free and secure mobile app. Search your App Store for "P3 Tips". Electronic tips submitted to Crime Stoppers are encrypted, entirely confidential and completely anonymous. The Whitbourne RCMP are investigating a break, enter and theft into I.J. Smith in Chance Cove. The incident occurred sometime between 9:30 p.m. on September 12, 2018 and 8:00 a.m. on September 13, 2018. A large quantity of cigarettes and lottery tickets were stolen. If you have any information regarding this incident, please contact Whitbourne RCMP at 709-759-2600. To remain anonymous, you can contact Crime Stoppers by calling 1-800-222-TIPS (TIPS is 8477), by Secure Web Tips by clicking the "Submit a Tip" button or by downloading our free and secure mobile app. Search your App Store for "P3 Tips". Electronic tips submitted to Crime Stoppers are encrypted, entirely confidential and completely anonymous. The Deer Lake RCMP is seeking the public's assistance in solving a break and enter on Route 420. Sometime between May 29th, 2018 and June 4th, 2018, a camper located in Taylors Brook Road, close to Sops Arm, NL was broken into. A number of items were stolen. The theft of cash was from a Black 2001 GMC Yukon while parked atrental home in Burnt Cove, NL. The theft occurred from the vehicle parked at the rental home Thursday. August 2, 2018 between 3:30 pm to 5:00 p.m.. The theft occurred while the owners were home with the vehicle parked outside the home. RCMP are also if any home or cabin owners in the area have video surveillance that can be reviewed to please contact police. If you know anything about this crime, please contact the Ferryland RCMP at 709-432-2440. If you wish to remain anonymous you can contact Crime Stoppers by calling 1-800-222-TIPS (TIPS is 8477), by Secure Web Tips by clicking the "Submit a Tip" button, or by downloading our free and secure mobile app. Search your App Store for "P3 Tips" Electronic tips submitted to Crime Stoppers are encrypted, entirely confidential and completely anonymous. You may be eligible for a cash reward. (St. John’s, NL), August 13, 2018 – The Royal Newfoundland Constabulary (RNC) Criminal Investigation Division is seeking the public’s assistance identifying the man responsible for an armed robbery in St. John’s. On Thursday, May 17, 2018 at approximately 8:20 a.m. officers with the RNC’s Operational Patrol Services Division, Police Dog Services, and Forensic Identification Services responded to an armed robbery at Burger King on Ropewalk Lane. The suspect entered the restaurant, approached the server, presented a weapon, and demanded cash. The suspect is described as a Caucasian male, 5’8, slim build. At the time of the offence he wore blue jeans, a dark sweatshirt with a front and back logo with a red hoodie underneath and carried a black backpack. The male fled on foot with an undisclosed amount of money. The RNC Criminal Investigation Division is continuing to investigate this armed robbery and is asking anyone who has information to call the RNC at 729-8000. If you wish to remain anonymous you can contact Crime Stoppers by calling 1-800-222-TIPS (TIPS is 8477), by Secure Web Tips by clicking the "Submit a Tip" button or by downloading our free and secure mobile app. Search your App Store for "P3 Tips" .Electronic tips submitted to Crime Stoppers are encrypted, entirely confidential and completely anonymous. You may be eligible for a cash reward. The Burgeo RCMP is seeking the public’s assistance in solving a theft on Route 480. 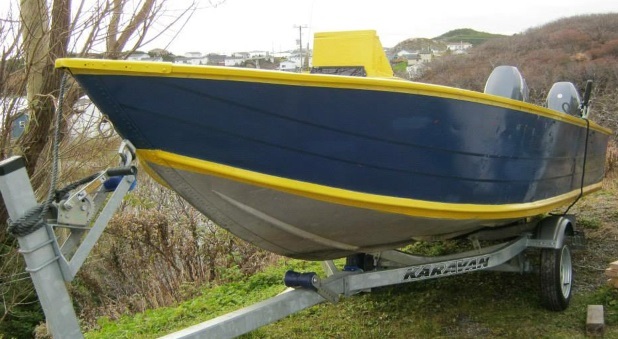 Sometime between Monday, July 9, 2018 and Saturday, July 14, 2018, a 16 foot aluminum boat and trailer was stolen from its storage area on Route 480 approximately 5 kms north of Burgeo. The boat is blue in colour with yellow trim and has a side console. The trailer is a 2011 Karavan with NL marker TGE 029. Serial Number is 5KTBS1810BF602252. If you know anything about this crime or can identify this person, please contact the Burgeo RCMP at 709-886-2241. If you wish to remain anonymous you can contact Crime Stoppers by calling 1-800-222-TIPS (TIPS is 8477), by Secure Web Tips at by clicking the "Submit a Tip" button or by downloading our free and secure mobile app. Search your App Store for "P3 Tips" .Electronic tips submitted to Crime Stoppers are encrypted, entirely confidential and completely anonymous. You may be eligible for a cash reward. The Happy Valley-Goose Bay RCMP is seeking the public’s assistance in solving a break and enter in Happy Valley-Goose Bay. Sometime between 5:00 p.m. on Wednesday, June 6, 2018 and 3:30 a.m on Thursday, June 7, 2018, a theft occurred at a construction site at 48 Roberts Road. A shed on the lot was broken into and a Dewalt Table Saw with a stand had been stolen. A side by side or quad may be involved in the theft. If you know anything about this crime, please contact the Nain RCMP at 709-922-2862. If you wish to remain anonymous you can contact Crime Stoppers by calling 1-800-222-TIPS (TIPS is 8477), by Secure Web by clicking the "Submit a Tip" button or by downloading our free and secure mobile app. Search your App Store for "P3 Tips" .Electronic tips submitted to Crime Stoppers are encrypted, entirely confidential and completely anonymous. You may be eligible for a cash reward. The Placentia RCMP is seeking the public’s assistance in solving a case of mischief. Sometime during the night of Friday April 27, 2018, a stain glass window was damaged in the Holy Rosary Catholic Church in Freshwater. The stain glass window was broken and pushed in. It is suspected the damage occurred in the early hours of Saturday morning. If you know anything about this crime, please contact the Placentia RCMP at 709-227-2000. If you wish to remain anonymous you can contact Crime Stoppers by calling 1-800-222-TIPS (TIPS is 8477), by Secure Web Tips by clicking the "Submit a Tip" button or by downloading our free and secure mobile app. Search your App Store for "P3 Tips" .Electronic tips submitted to Crime Stoppers are encrypted, entirely confidential and completely anonymous. You may be eligible for a cash reward. On April 19th, 2018 at approximately 9:10pm Holyrood RCMP received a report of a motor vehicle collision hit and run involving a pedestrian near Wilson's gas station on the Conception Bay Highway in Avondale that occurred at approximately 9:05pm. The victim sustained minor injuries to her left arm. Evidence gathered through the investigation would suggest the victim was struck by the passenger side mirror of the vehicle. The victim could not provide a licence plate, make, model or colour of the vehicle. The vehicle fled the scene of the accident travelling on the Conception Bay Highway toward Conception Harbour. If you know anything about this crime, please contact the Holyrood RCMP at 709-229-3892. If you wish to remain anonymous you can contact Crime Stoppers by calling 1-800-222-TIPS (TIPS is 8477), by Secure Web Tips by clicking the "Submit a Tip" button or by downloading our free and secure mobile app. Search your App Store for "P3 Tips" .Electronic tips submitted to Crime Stoppers are encrypted, entirely confidential and completely anonymous. You may be eligible for a cash reward. The Ferryland RCMP is seeking the public’s assistance in solving the theft of a vehicle from Mobile First Pond Rd. 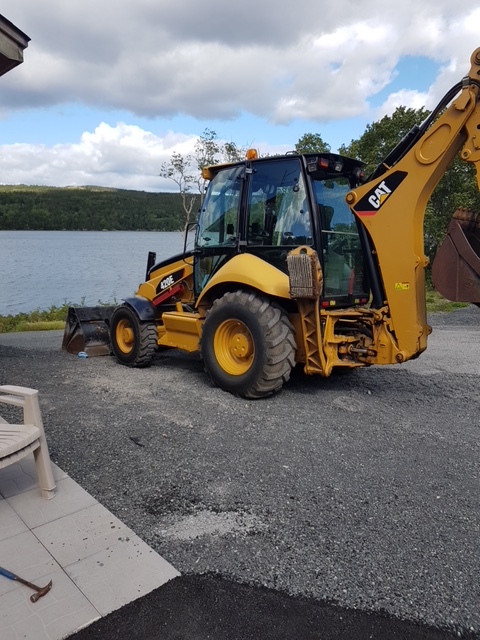 The theft of the 2008 Yellow Cat Back Hoe model 420E occurred from a cabin lot sometime between Friday April 6th at 1:30pm to Saturday April 14th at 10:00 am. It is unclear if the vehicle was driven or removed on a trailer. RCMP are also requesting if any home or cabin owners in the area have video surveillance that can be reviewed to please contact police. If you know anything about this crime, please contact the Ferryland RCMP at 709-432-2440. If you wish to remain anonymous you can contact Crime Stoppers by calling 1-800-222-TIPS (TIPS is 8477), by Secure Web Tips by clicking the "Submit a Tip" button, or by downloading our free and secure mobile app. Search your App Store for "P3 Tips" .Electronic tips submitted to Crime Stoppers are encrypted, entirely confidential and completely anonymous. You may be eligible for a cash reward. The Deer Lake RCMP is seeking the public's assistance in solving a theft. Sometime before January 23rd, 2018, approximately $8000.00 worth of scaffolding was stolen from the Hampden Construction Site, located about 2 km off the Trans Canada Highway on Route 421. If you know anything about this crime, please contact Deer Lake RCMP at 709-635-2173. If you wish to remain anonymous you can contact Crime Stoppers by calling 1-800-222-TIPS (TIPS is 8477), by Secure Web Tips by clicking the "Submit a Tip" button or by downloading our free and secure mobile app. Search your App store for "P3 Tips". Electronic tips submitted to Crime Stoppers are encrypted, entirely confidential and completely anonymous. You may be eligible for a cash reward. The Ferryland RCMP is seeking the public’s assistance in solving numerous break and enters and thefts from trailers on Witless Bay Line. Numerous travel trailers and campers were broken into and damaged in a popular gravel pit on Witless Bay Line were upwards of 30 trailers are parked there all year. The offences occurred between January 29th to February 1st, 2018. The suspects would have used a vehicle in the crime. The Gander RCMP is seeking the publics assistance is solving a break and enter at the Gander Curling Club. On Monday, February 5, 2018, someone broke into the Gander Curling Club at approximately 10:15-10:20 p.m. Nothing was taken but photos were obtained from a security camera. It appears the suspect is a male wearing a red brimmed baseball hat with a black hoodie and a camo jacket. If you know anything about this crime, please contact the Gander RCMP at 709-256-6841. If you wish to remain anonymous you can contact Crime Stoppers by calling 1-800-222-TIPS (TIPS is 8477), by Secure Web Tips at the link below, or by texting TIP190 and your message to CRIMES, which is 274637. Electronic tips submitted to Crime Stoppers are encrypted, entirely confidential and completely anonymous. You may be eligible for a cash reward.